January 2016 - my name is Food. 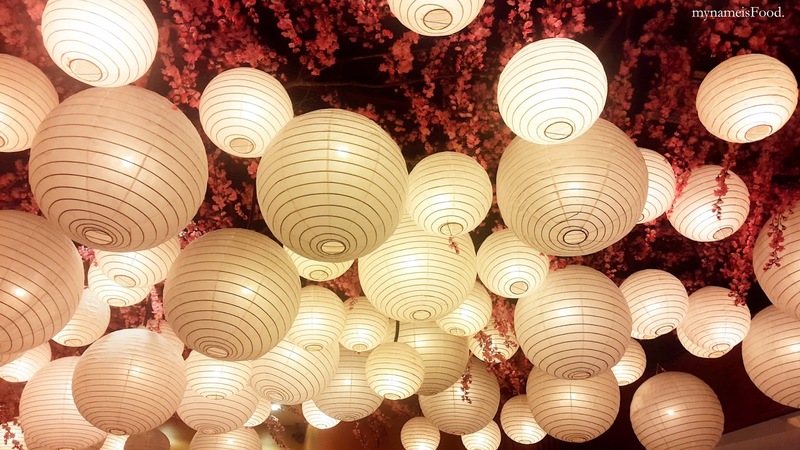 It's not often you see a Thai restaurant around so when one popped out in Ciputra World Mall, I was interested in trying it. Although the location may not be very eye-catching, being behind the escalator and at a corner, the interior do live up to its name having a blue light ambience and blue motive cushions and so on. It was rather empty when we arrived but a few tables started to fill not long after. 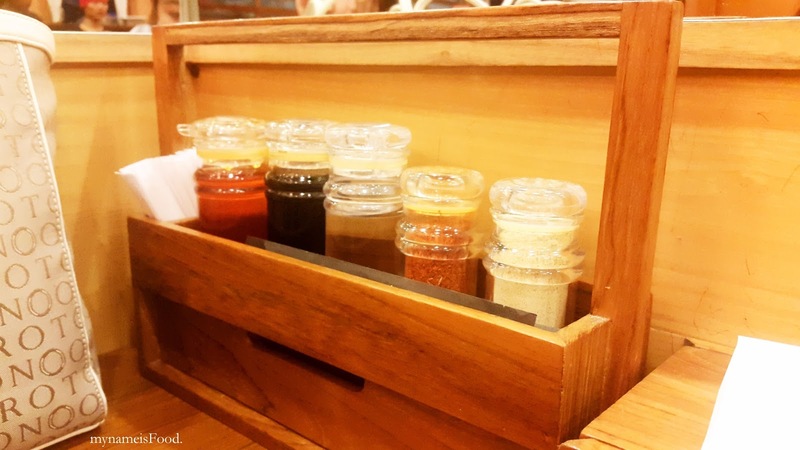 It may be hard with contending with the other restaurants around since there are other different choices of cuisines to eat where Indonesians are more aware of and used to. 'Pad Thai' (IDR45rb - AUD$4.5) is a traditional Thai dish consisting of stir fried thin noodles with prawns, bean sprouts, bean curd, chives and dried shallots. They also served it with a vinaigrette chopped chilli and pickles on the side where I did not try it. 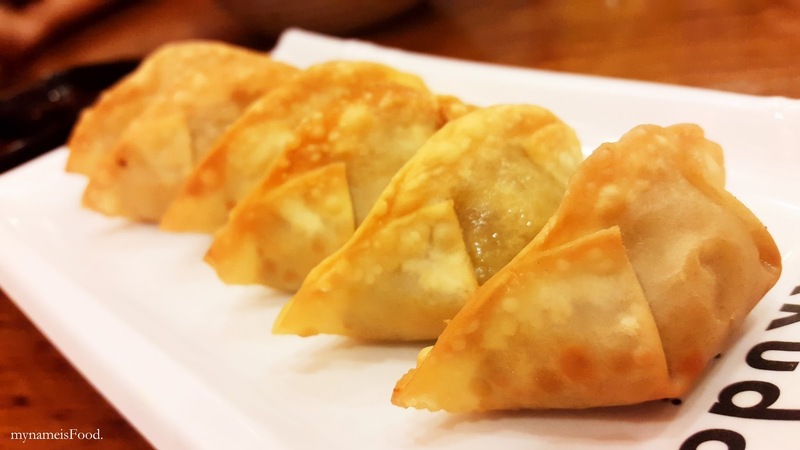 On the side of the rectangle plate, they do offer a bit of a slice of lime wedge, chopped nuts, ground chilli pepper, bean sprouts and chives. The Pad Thai seemed to be sweeter than usual, hence the reason of having the sides of the lime wedge and so on to allow the taste to be more balanced. When you do mix it all together, it does taste much better than how it was originally. I also thought however it was a tad too oily. 'Tom Yum Kung' (IDR29rb - AUD$2.9) is usually what everyone would order when eating thai, which is an authenic hot and sour prawn soup enriched with thai herbs and lemon grass. There is another option of buying it with milk which I think they meant coconut milk/cream which would make the soup creamier. To be honest, I'm not a big fan of Tom Yum soup as it wouldn't be the first dish in my mind to order but I found this dish to be very sour. The waitress did offer a rice to go along with it, but I always felt and ate the soup as an entree instead of a main. But ye, probably a bowl of rice would have been better but if not, definitely too sour than it should be. 'Keng Keao Wan Kai' aka. Chicken Green Curry (IDR34rb - AUD$3.4) is definitely a dish that you should try when you are here because I felt that this was probably the only dish that I quite liked out of the three. 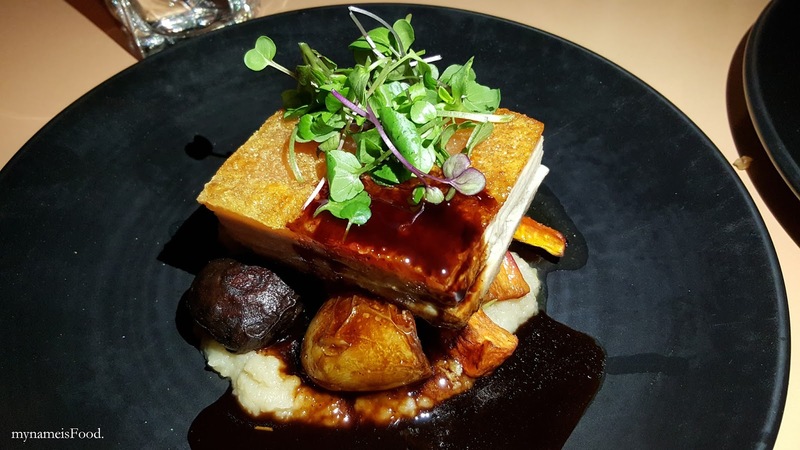 However, do note that the portion is quite small so even sharing it between 2 people may not be enough. Even for one person, you might still get a bit hungry, of course not if you eat it with a bowl of rice. 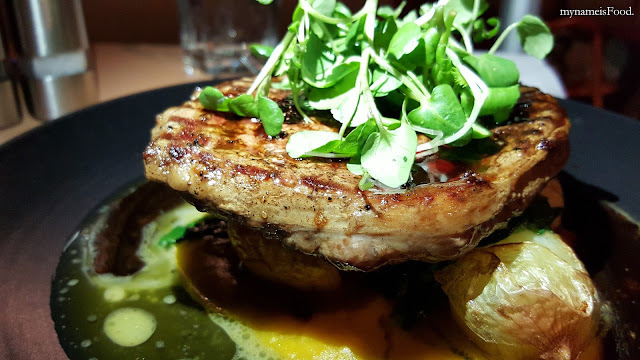 The curry is made from a green curry paste cooked in coconut milk, fragrant basil and eggplants. The meat is your choice which varies how much the dish would be in where we chose Chicken as the meat. The eggplants was only a few plus there were a few chicken pieces along with some greens such as green beans inside. A little splatter of cream/coconut cream is on top where you are able to mix the curry with it to give it a creamier taste. It would have been nice if the curry portion would be a bit more but the combination of the chicken and eggplant was done well, a bit spicy but the spices and herb was enough to get that distinct flavour of the green curry which was nice. 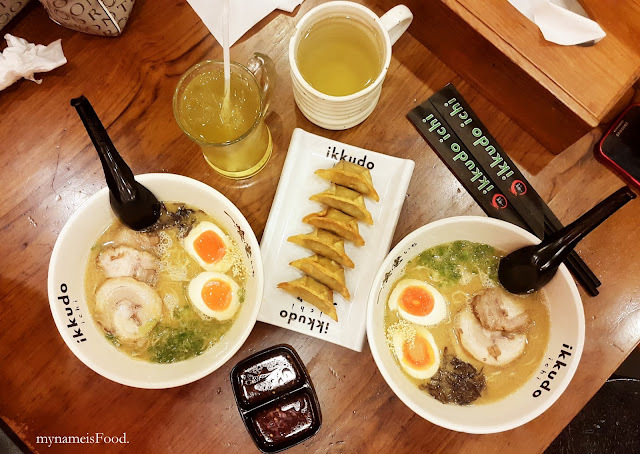 Ikkudo Ichi is one of the many Ramen places you can dine at Grand Indonesia Mall in Jakarta. 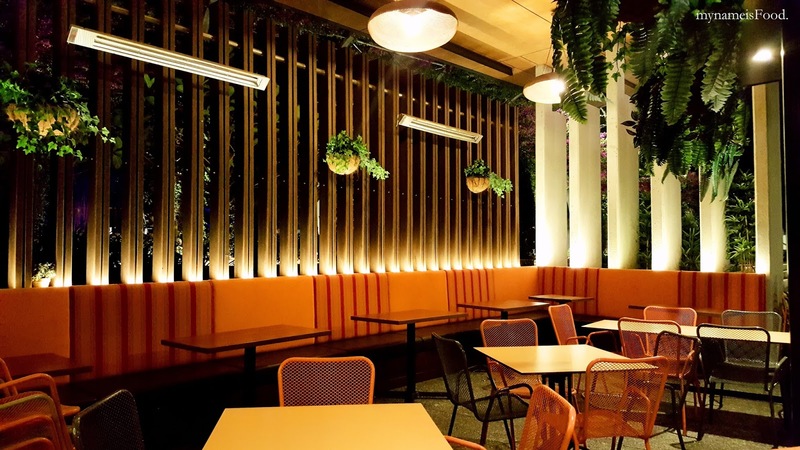 It is quite a small area inside but fits a decent amount of diners, though you might have to wait for a bit sometimes when they do have a queue. I would say though overall that the ramen here reminded me of the ramen back here, but it just had a more Street and casual feeling..
As you can see, the restaurant itself is quite small and we arrived here after work quite early so it wasn't right on dinner time allowing us to get our table quickly and by the time we finished eating, there were so many diners coming in. When we sat down, we were offered drinks and we ordered both a 'Hot Ocha' and 'Cold Ocha' (Both at IDR9,8rb - AUD$0.98). 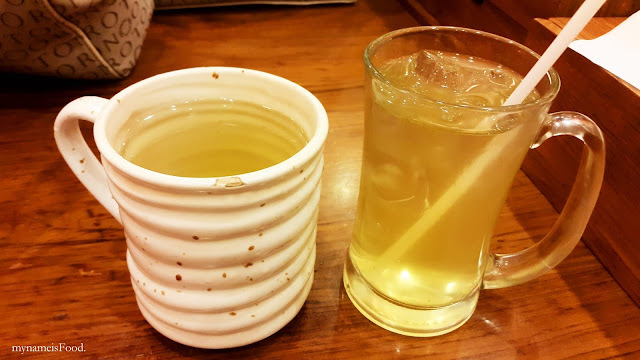 It's nice to see when Japanese restaurants serves their green tea using real tea leaves, and not just tea bags.. Quite dissapointing if they do. Gladly, they used real tea leaves as you can taste a bit of the residue as you get to the bottom. 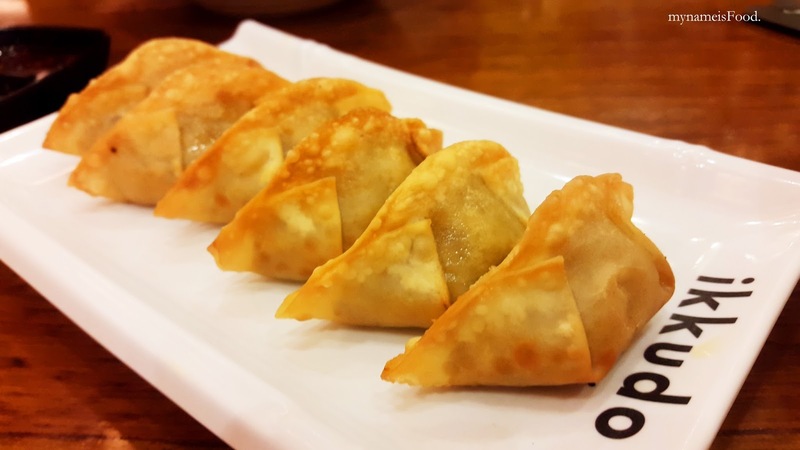 'Age Buta Gyoza' (IDR28rb - AUD$2.8) are Deep fried Pork Gyoza in which a portion gets you 6 pieces which I found was a normal amount in Japanese restaurants. It was rather small than I thought it would be but not too much. 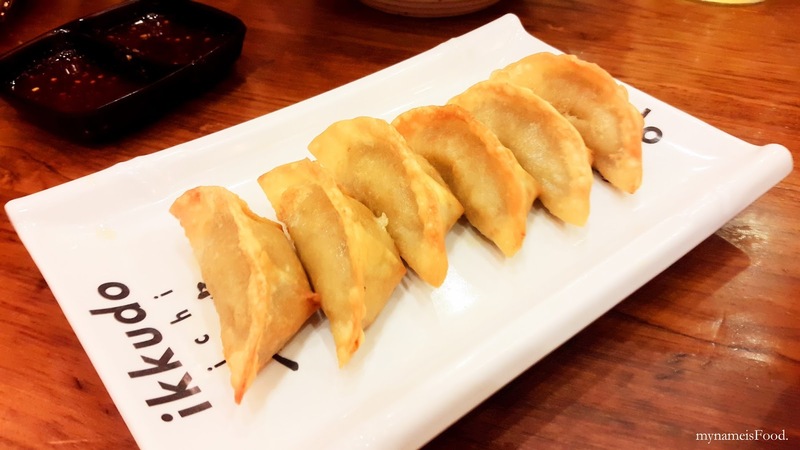 It was fully deep fried and there are also grilled gyoza if you would like a healthier option on the menu. 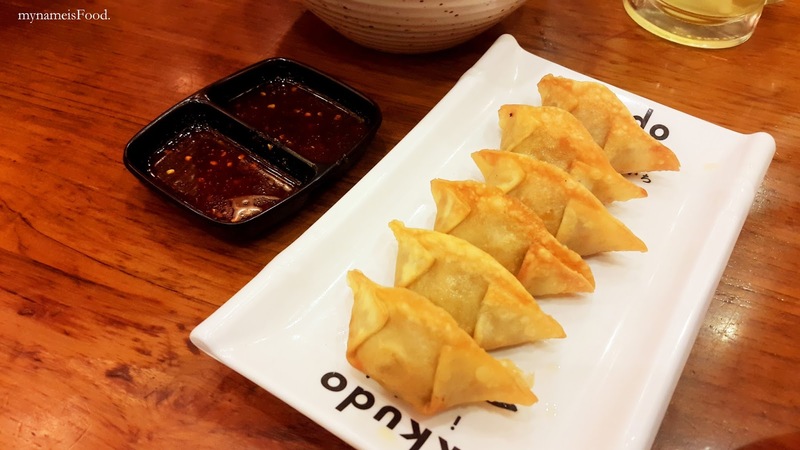 I found that just a simple light soy sauce as a sauce was a nice dipping sauce instead of a sweet chilli or a chilli sauce given along with the dumplings. It was very hot when it arrived so be careful when biting into it. The filling was delicious with the pork broth oozing out a bit as you bite through it. 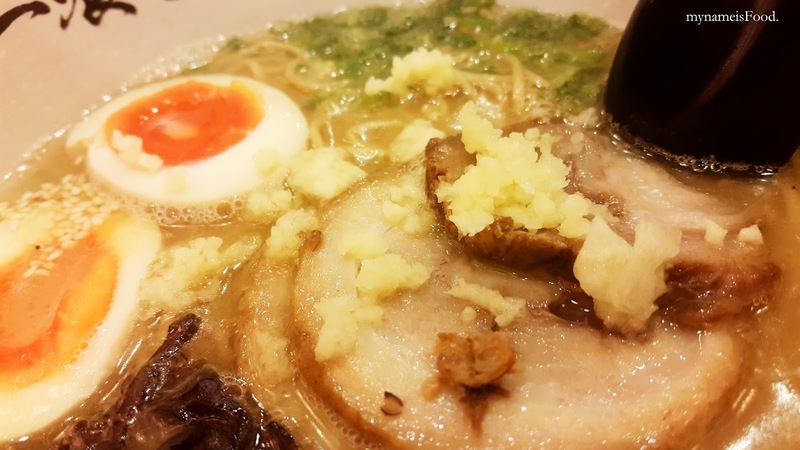 All ramens are served with either chicken or pork charsiu, spring onions, sliced mushrooms and soft boiled golden egg. We both ordered the same which was 'Tori/Buta Signature' (IDR49.8rb - AUD$5) which was their Signature ramen served with either Chicken or Pork Charsiu in which of course, the choice of meat would be obviously Pork Charsiu. 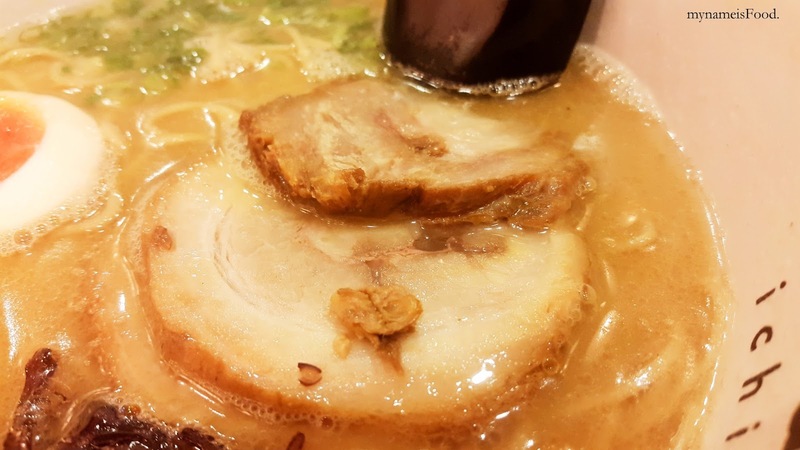 The first thing that you see when you get a big bowl of ramen on your table is its presentation, then you see if the soft boiled egg is done right, then you check if they have given you a sufficient amount of charsiu, then you take a spoonful of the broth, sip and taste it, try their ramen noodles... then judge and comment.. well, that's the way I eat my ramen usually. 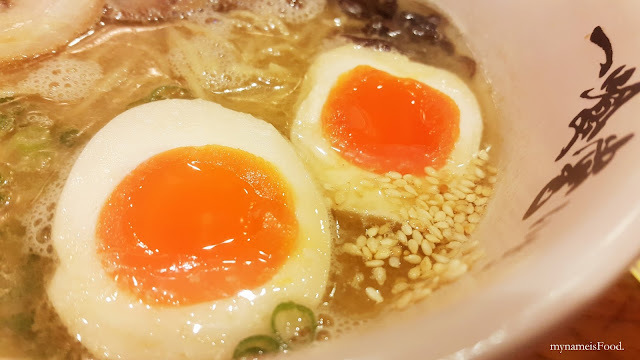 Soft boiled eggs were cooked nicely, the broth reminded me of your Tonkotsu base but it seemed to be a bit thicker compared to the lighter version. Full of flavour, the seasoning and spices has been balanced out well, the ramen noodles were chewy and cooked through well. 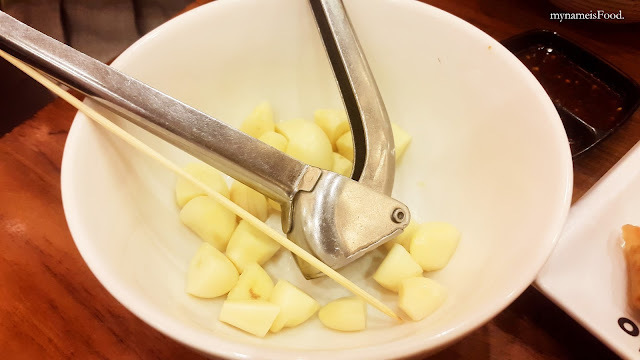 One of the best thing you get here where you won't get anywhere else (even in Aussie, I haven't been to a Ramen place where they would offer this..) is that they serve you fresh garlic along with a wooden skewer and a garlic press. Why? So that for those garlic lovers, like myself... is able to mince your own garlic whilst inserting it into your ramen, as much or as little as you would like. What a fun but also very garlicky way to eat your ramen. Although not all ramen is good with garlic, or may not suit it as well as it being how it should be, having a few garlic cloves is always so gooodd I reckon.. And yes, with just being the two of us dining, we did finish the whole garlic portion given in the bowl. 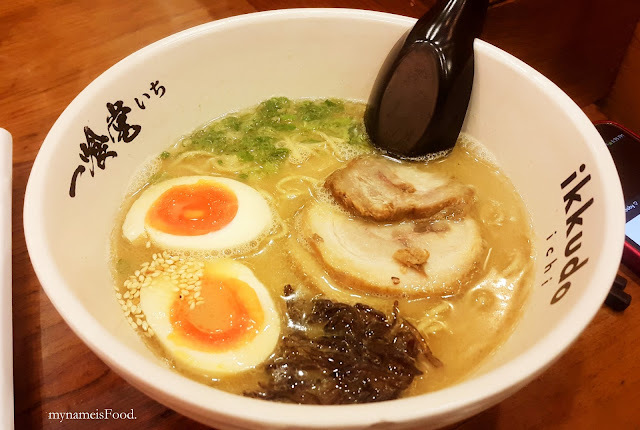 One of the nicest, humblest Japanese Ramen places to dine at, I would come back here again and try their other Ramen.. Maybe their Curry ramen or their Tsukemen..
Cove Bar and Dining lies among South Bank's river quay with the views of the Brisbane river right in front of you while you dine. 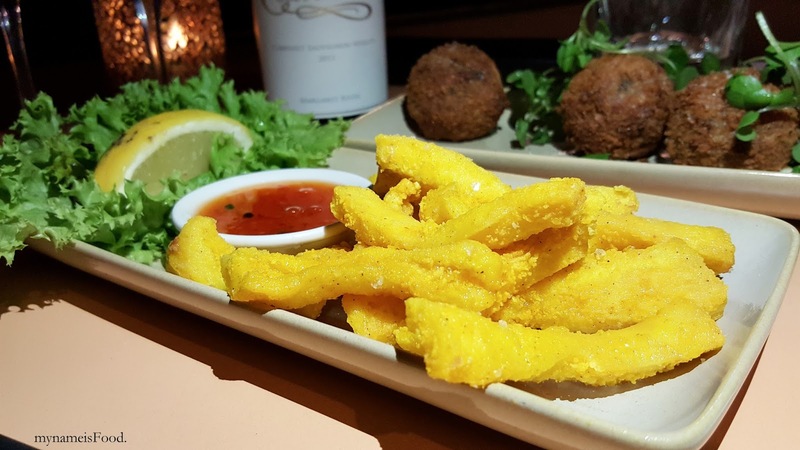 Having a laid back dining in an elegant surrounding, this restaurant offers dishes from breakfast to having a romantic riverside dinner or even for gatherings or parties. What highlights the restaurant would have to be its view of the river. A new app has launched in November offering members a bottle of award winning wine when dining at participating restaurants and this new app is called 'Free Wines'. 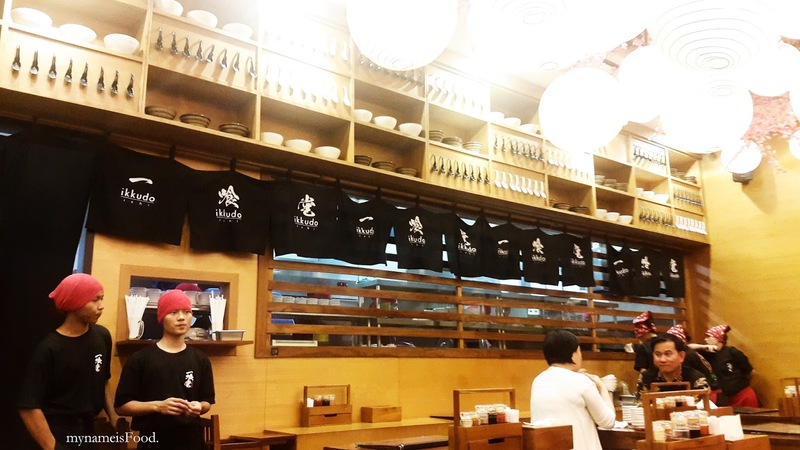 The participating restaurants rangers from local restaurants to hatted restaurants which suits everyone who simply love to eat. Did I mention that this was available Australia wide? So whether you are in New South Wales or Queensland, South Australia or Victoria, there will be participating restaurants available. Last of all, the best thing about this app is that it is free.. Yes, I am not kidding. It costs nothing to download nor do you have to buy it to be able to experience it. Imagine dining at a restaurant whilst being able to be treated to a complimentary bottle of vino of red or white of your choice. 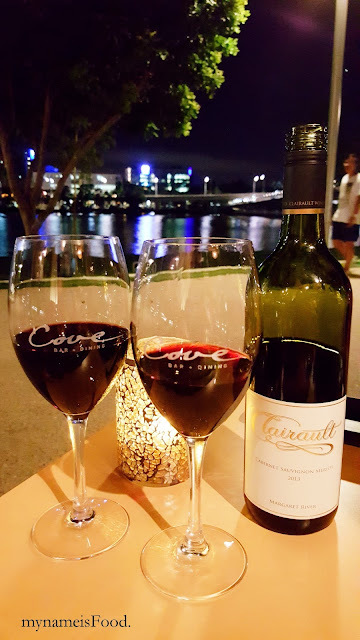 After having clicked on the restaurant, we would then choose our wine out of two choices, Clairault Cabernet Sauvignon-Merlot or First Creek Chardonnay, in which we chose the red wine to have. It took a while for the waitress to bring the wine over to the table but it didn't really bother us as we were enjoying the view while sipping on water. 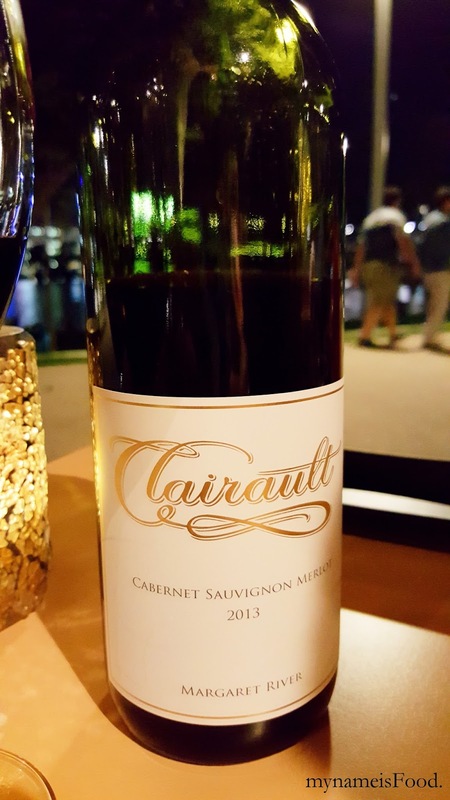 Clairault Cabernet Sauvignon-Merlot, Margaret River, Western Australia (5 Star rated winery) consists of perfumes of cedar and blackcurrant with hints of clove and tobacco leaf lead to a savoury, dry, long palate with gentle tannins. To start off our meal, 'Salt n Pepper Squid' ($19.5) consists of marinated baby squid, deep fried with saffron salt and pepper served with a passionfruit sweet chilli sauce. 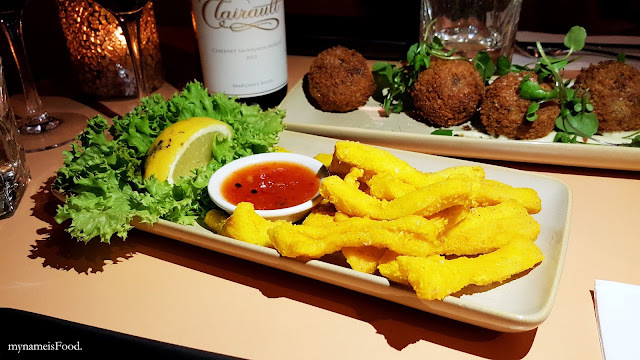 What intrigued us at first when it arrived was how bright yellow the batter or crumb was in which I thought that they may have tried something different by maybe using tumeric but in terms of the squid meat, it was very thick and chewy which was delicious and juicy. It is always quite upsetting when you buy Salt and Pepper squid and find that most of it would be the crumb or the batter but only thin meat in the middle. The passionfruit sweet chilli was quite interesting in a way but I didn't find it anything wow. 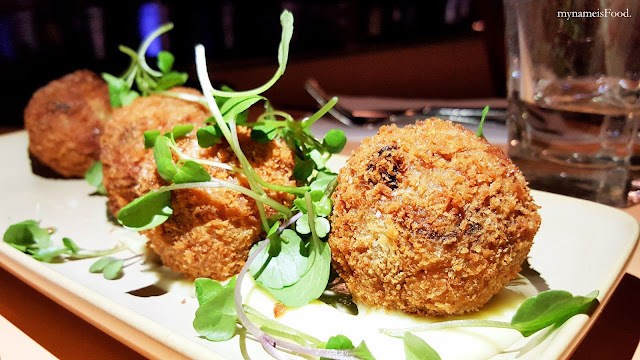 Another starter we decided to share is 'Tum Yum Mushrooms Arancini' ($15.5) which I thought was quite different combining tom yum and mushrooms together as an Arancini. Deep fried risotto balls with their 2014 chilli cook off award winning chilli paste, mushrooms and fresh herbs served with roasted garlic aioli. 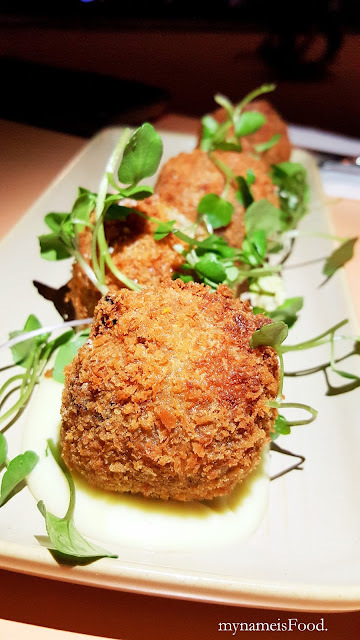 The chilli paste allowed the Arancini balls to be slightly spicier than I thought but not too much, the risotto was cooked nicely and with the combination of the mushrooms, it made this starter to not feel as heavy as it should be with the usual arancini you would eat. Do be careful when you take a bite of it as it can get very hot in the middle. The mushrooms seemed to have been diced thinly allowing it to somehow get absorbed into the risotto not allowing its individual taste and chewiness to shine amongst the other elements. However, one downside would be that there wasn't enough garlic aioli for all the arancini balls. 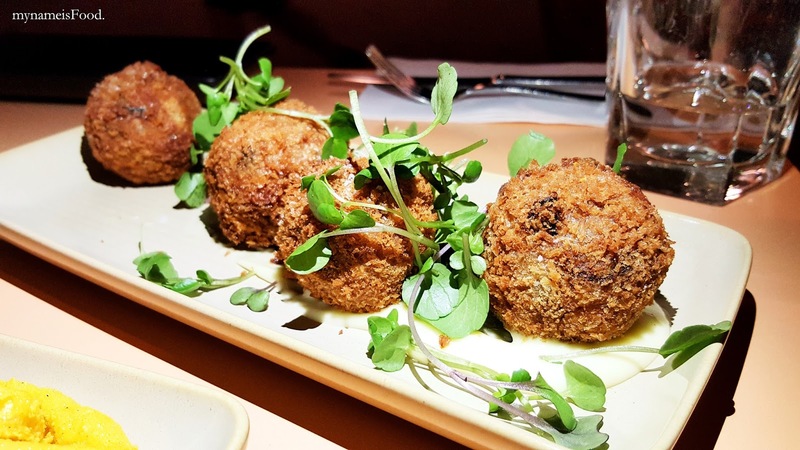 Although it was placed underneath the balls, it might have been a better idea to put it in a small saucer on the side or just put more sauce. The micro herbs was very cute and gave the whole dish a nice elegant touch. 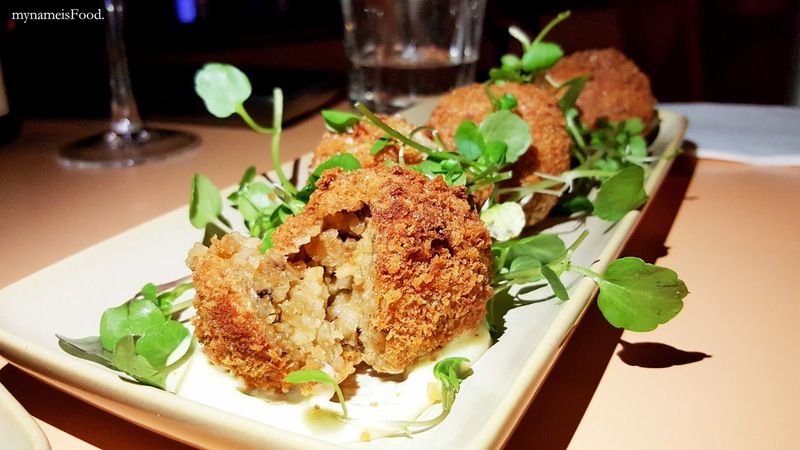 As you can see from the photo below, you are able to see that it has been created nicely with a thin layer of crumb and the risotto and filling inside. 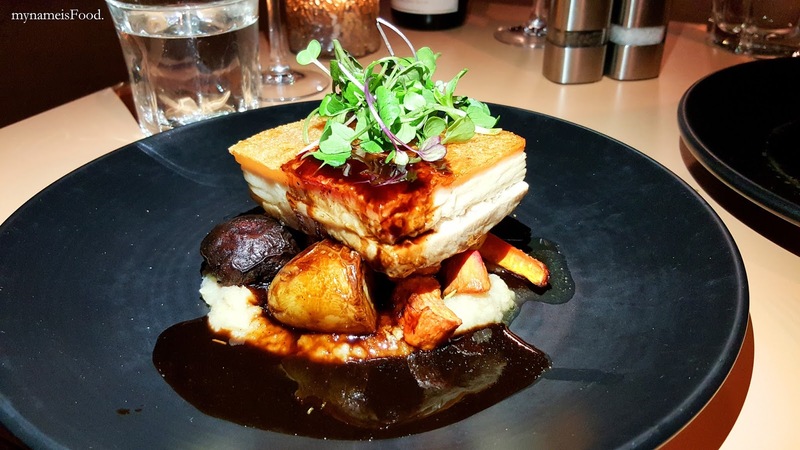 'Twice Cooked Crispy Pork Belly' ($34) was one of the mains that caught my eye as it said it was a Twice cooked crispy pork belly served with apple and parsnip puree, roasted root vegetables with house made jus. 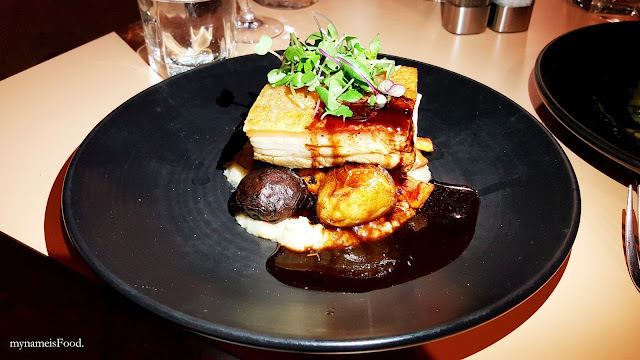 I've tried twice cooked crispy pork belly before and was one of the best and so far, no other restaurants have beaten that succulent, juicy taste. So, I wondered if this would blow me away.. The crispy skin was crackling but made it hard to cut through the meat along with the skin, resulting in having to cut the meat first then forcefully try to knife through the skin but if not, then it would resort to biting it. The pork belly meat was juicy and mixed in well with the jus. The various vegetables was a delight with a mixture of potato and sweet potato and so on. What I enjoyed other than the roughly thick cut vegetables was the apple and parsnip puree which I thought was quite interesting as it did not have an overpowering sweetness from the apple as it was well balanced. Unfortunately, the twice cooked crispy pork belly was yum, but still did not blow me away to make it my no. 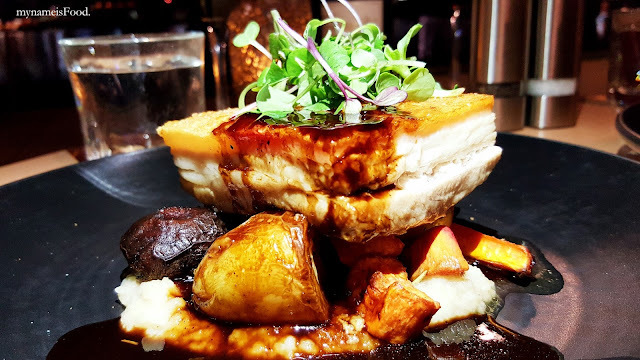 1 twice cooked pork belly. '100 Day Grain Fed Rib Fillet' ($34) weighed 300g which was quite big in size served with rosemary roasted stew potatoes, honey carrot puree and garlic buttered kale with red wine jus. 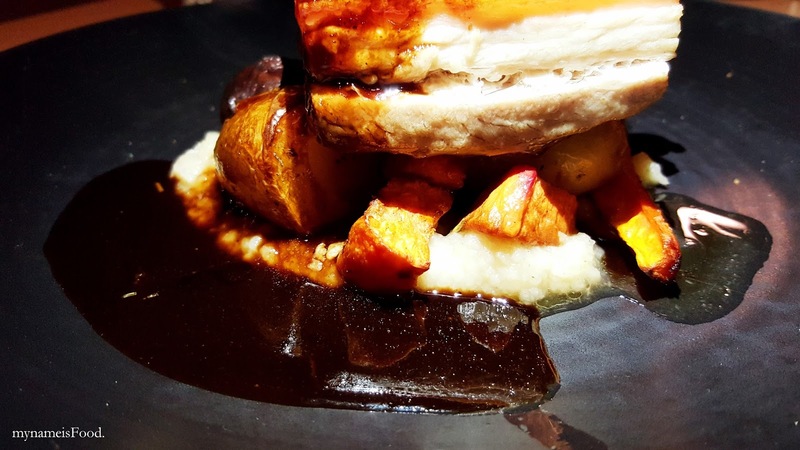 Presented beautifully, it was interesting how you are able to see the outlining of the jus and the puree and how they were able to not fully get mixed up together. 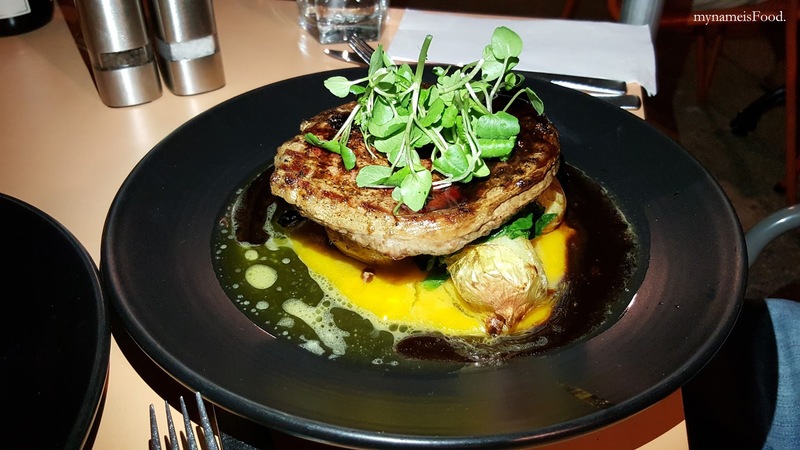 The brightness of the carrot puree allowed the dish to have a hint of bright colour. 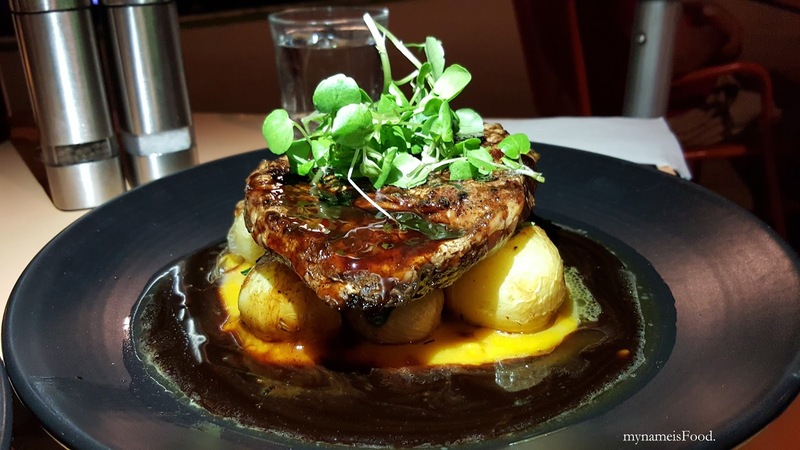 The rib fillet was cooked well however there were quite a bit of fats around it which we ended up leaving it aside but the steak was complemented with the stew potatoes and also the puree. 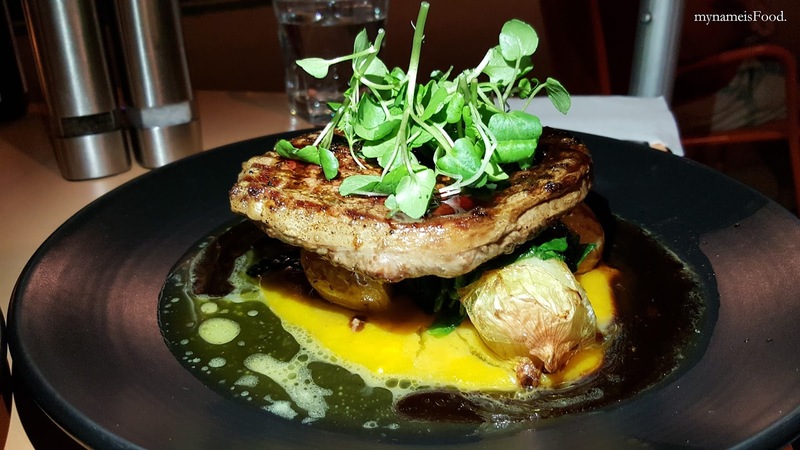 I found that what made this dish quite unique was not the potatoes nor was it the kale, but the honey carrot puree. Imagine having to dine at a restaurant and even by ordering only two mains let's say and a bottle of wine.. just imagine how much that would've cost in total. 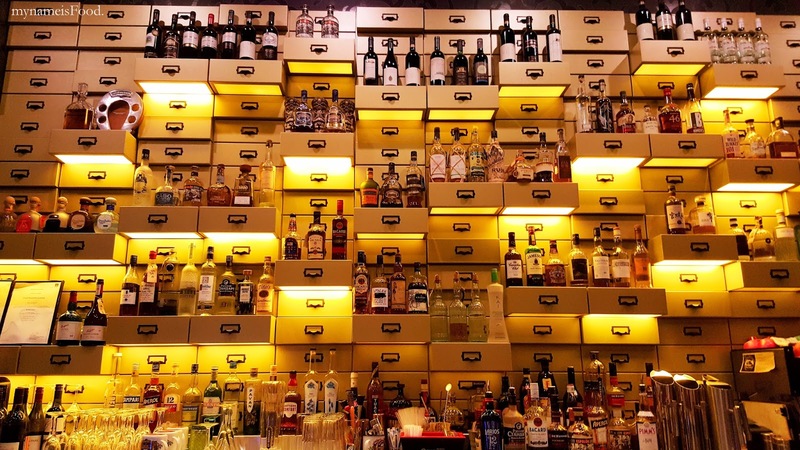 By having to be able to order a free wine to accompany your meal with your loved ones, it's not how much money you save that matters, but it shows how there are people out there who do care about the diners and their experiences, allowing them to not only enjoy but also being able to try and taste various wines which would allow us to buy one of our own next time. So, I do suggest you all download this superb app and try it while you can. *mynameisFood. 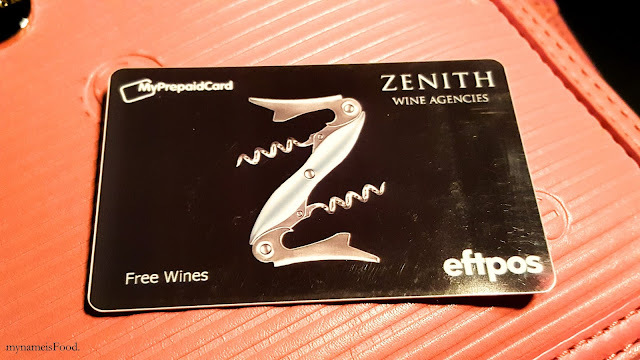 dined as a guest at Cove Bar and Dining to experience using the Free Wine App provided by Zenith Wine Agencies, however, all opinions and reviews are my own.